Abstract: In this work, fluorescent quantum dots (QDs) and gold nanoclusters (Au NCs) are confined in a drop to develop a novel sensing platform for metal ions and organometals at trace level (detection limits in the range of micro-to-nano molar). A portable micro-fluorospectrometer was employed for fluorescence measurement. CdSe and core-shell CdSe/ZnS QDs were stabilized with hexadecylamine (HDA) and dispersed in an organic drop (n-octane, decane). Metal species were incorporated into the sensing drop following headspace single-drop microextraction. This integrated system allows the isolation of the target analyte, its preconcentration and recognition in a smart way. 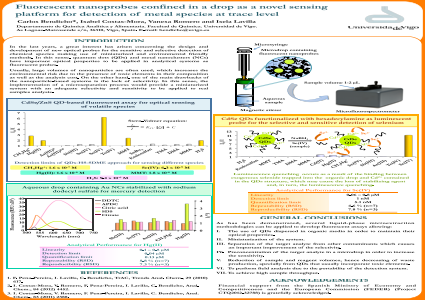 Advantages of the novel approach include increased selectivity (phase separation removes potential matrix effects) and sensitivity as well as low consumption of nanoprobes. Consequently, the generation of toxic wastes due to elements contained in the QD composition (e.g. Cd, Se) is kept to a minimum. In addition, no functionalization of the nanoprobes is required, their dispersion in the organic solvent together with a stabilizing agent being enough for sensing. Several metal species such as selenite, methylmercury, methylcyclopentadienyl-manganese tricarbonyl, etc. quenched the QD fluorescence following the Stern-Volmer equation. Significant quenching was also observed for non-metal compounds such as hydrogen sulphide. Au NCs stabilized in an aqueous drop with sodium dodecyl sulfate (SDS) and following the same approach as above have proved to be sensitive for the detection of inorganic mercury. The novel sensing platforms may open the door to on-site trace metal analysis and speciation, with a performance similar or even better in comparison with analytical techniques typically used in central labs. Acknowledgements: Financial support from the Spanish Ministry of Economy and Competitiveness and the European Commission (FEDER) (Project CTQ2012-32788) is gratefully acknowledged.